We are one of the fastest growing companies in the U.S. and the world's #1 product roadmap and marketing planning software. 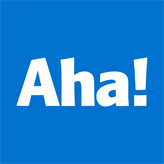 More than 250,000 users worldwide trust Aha! to set brilliant strategy, create visual product roadmaps, and deliver breakthrough marketing campaigns. It started in 2013 with a simple idea — to build a company that customers and employees would love. And to do it with no venture funding, offices, or salespeople. At Aha! we believe that customer and employee joy should be the aim and core of a company's existence. We are changing the way companies innovate and launch great products. It has been an amazing journey and we have been humbled by our rapid growth. Generous salary, equity, benefits, and profit sharing. Want to get notified about new jobs at Aha!? Remote DevOps Engineer [Ruby on Rails - Chef - AWS] at Aha!